ProBono.Org is exceptionally saddened and shocked by the tragic passing of Nomboniso Nangu. Nomboniso, the director of the National Alliance for the Development of Community Advice Offices (NADCAO) who passed away on 8 April 2017, was devoted to furthering the interests of the community advice office sector with untiring passion and commitment. Even when it seemed that the sector was unable to survive in trying economic times, she forged ahead and always remained a constant figure in the fight for recognition of grassroots level advice offices in the country and in the continent. 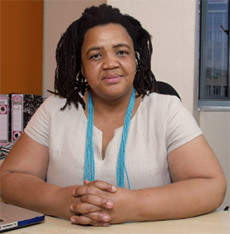 For the past two years, Nomboniso was a judge at the ProBono.Org Annual Awards Ceremony. With the other judges, she had to decide on the winners and finalists for various awards, including pro bono service by private legal professionals, students at law clinics, paralegals at community advice offices, and legal NGOs. She devoted considerable attention to ploughing through pages and pages of entrant applications and contributed her own insights and suggestions indicating her knowledge and experience of the needs of poor and vulnerable people in accessing legal services. Her loss is a enormous blow to the social justice and community advice office sector, and it will be hard to fill the void she leaves. We send our deepest condolences to her family, her colleagues and her friends.